Mildred Holst, 96, of Fort Dodge was welcomed to heaven by her Savior on Friday July 27, 2018 after a short, unexpected illness. Memor­ial visitation will be held from 5:00 – 7:00 p.m. Tuesday, July 31 at Gunderson Funeral Home & Cremation Services. Interment of her cremated remains will be held 9:30 a.m. Wednesday, August 1, 2018 at Deer Creek Cemetery near Clare, where she was a 55 year member of Trinity Lutheran Church. Memorial service will be held 10:30 a.m. August 1, 2018 at St. Paul Lutheran Church. 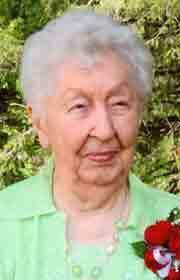 Mildred Kostman was born on March 7, 1922 in Bloomer, WI. She graduated from Rock Rapids High School and Lutheran Hospital School of Nursing in Sioux City. On February 25, 1945 Mildred was united in marriage to Alfred Holst and they made their home on a farm near Clare. She was employed as a Registered Nurse working on the medical-surgical floor and as evening nurse supervisor at Lutheran Hospital, Bethesda and Trinity in Fort Dodge for 37 years. Mildred was a 60 year volunteer for the Webster County Chapter of the Red Cross. After retirement she volunteered at the Blanden Art Museum, at Friendship Haven and RSVP Senior Center. She enjoyed reading, sewing, gardening and St. Paul’s Bible Study, where she was currently a member. Survivors include her children Linda (Dan) Bloomfield of Ponca, NE, Chuck (Sandi) Holst of Climbing Hill, Carol (Craig) Stripling of Clare, Nancy (John) Eilertson of Kiester, MN, Lorri (Wally) Harms of Springfield, OR; 14 grandchildren, 12 great grandchildren, her sisters Marvel, Eleanor, and Dolly and her brother Bud (Doris) Kostman. She was preceded in death by her husband Alfred in 1977, her parents, 3 sisters and their spouses, 1 brother and her granddaughter Elizabeth. In lieu of flowers, memorials may be directed towards the Lutheran Hour or to the Paula J. Baber Hospice Home.